If we’re not Don Brash, we likely have some degree of tact when the topic of te reo Māori arises. Some of us just know the basics: kia ora, ka pai, whānau, aroha; some can hold basic conversation, and others still are fluent. No matter how proficient our reo is, it’s important we get involved in te wiki o te reo Māori. If like me, you’re Pākehā, you may be unsure how the language is relevant to you personally, and you may even feel a bit outside of it all. Hopefully, I can help to unpack and answer that question for you. What Kiwi kid doesn’t know ‘One Day a Taniwha’? The nostalgia is real. As a child, I loved singing waiata like Tōia Mai, Purea Nei and Paikea at school, and was a member of the kapa haka group. In year 2, we learned the well-known karakia, Whakataka te Hau, reciting it at the beginning of the school day. I distinctly remember my year 4 teacher teaching us the correct pronunciation of a Māori place name: “It’s not Parra-parram, it’s Paraparaumu” and feeling perplexed: but that’s how Dad says it? Eight-year-old me learned something that day, but it still wasn’t until about two years ago that I actually started calling myself out and taking the time to give Māori names the proper pronunciation they deserve. In year 6, I remember writing my pepeha for the first time – I think it’s awesome that the new cohorts of BSc students are now required to write and perform a basic mihi, and I think it should be more commonplace, both across other college departments and in general. This Māori worldview of one’s own connection to whenua/land and whakapapa/genealogy is unparalleled in English and is truly invaluable. Given that Māori are the indigenous people of Aotearoa, it makes sense that kaitiakitanga (guardianship) of the land is at the centre, and I wish that we could all embrace and value this as a nation. Both my primary school’s principal and some of my primary teachers were Māori, and our school’s kaupapa was ‘Creating Thinkers, Celebrating Diversity’. I think that because of this, our school was staunchly bicultural and emphasised the importance of Māori culture. Upon reflection as a young adult, and through talking to others about their experiences of te reo Māori at primary school, I have realised that I have been really privileged to have had these kinds of opportunities as a kid. Additionally, I have learned that not all schools shared the same pride in and emphasis on te ao Māori, and I think that is a real shame. After all, te reo Māori is an official language of New Zealand: it is about time we treated it like one. It makes sense to teach it in schools, and I think it is a part of respecting tāngata whenua as our treaty partners. My first noho marae stay as a teenager was a spiritually moving experience. Learning the whakapapa of the ancestors in the wharenui, the atua who govern nature, the pōwhiri welcoming, hearing the karanga, and reciting karakia mō te kai all gave me deeper understanding of Māori tikanga (customs). A turning point for me in learning te reo Māori was when I attended Ōtaki Summer Camp in January this year. I highly recommend it to anyone who’s interested in environmentalism, social activism, politics, and meeting new people. The town of Ōtaki itself, nestled in the Kapiti Coast, is one of the most – if not the most – bilingual town in Aotearoa. According to the 2013 census, 16.8% of all Ōtaki residents and just over half of Māori residents spoke te reo Māori. In comparison, the national average of te reo Māori speakers was 3.7%. The bicultural nature of Ōtaki made it the perfect location for such a camp. Ōtaki Summer Camp placed a strong emphasis on te ao Māori, normalising te reo, observing tikanga and had a wide range of speakers from diverse cultural and academic backgrounds. It was there that I caught a glimpse of what a truly bilingual New Zealand could look like, and I became determined to be the change I wanted to see. Naturally, as someone who is fascinated by language and the window it opens into a deeper understanding of culture, I threw myself into learning te reo Māori. In my experience, learning te reo Māori as a Pākehā person has so far been a richly rewarding, insightful and spiritual experience. The Māori language presents its own unique worldview and cultural perspective. I admire its roots in nature, whakapapa, whakaaro and wairua that in my opinion, English doesn’t convey in the same way. I think that anyone, given the opportunity and equipped with the passion to learn will see the beauty of the reo. 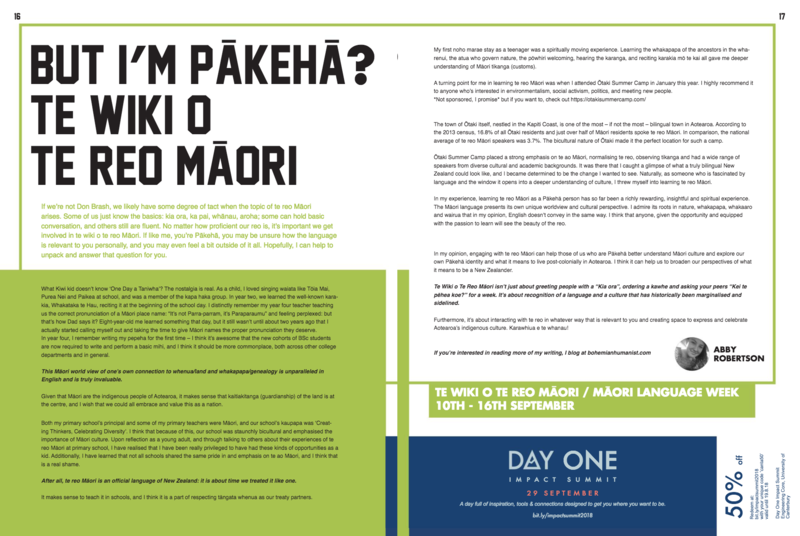 In my opinion, engaging with te reo Māori can help those of us who are Pākehā better understand Māori culture and explore our own Pākehā identity and what it means to live post-colonially in Aotearoa. I think it can help us to broaden our perspectives of what it means to be a New Zealander. Te Wiki o Te Reo Māori isn’t just about greeting people with a “Kia ora”, ordering a kawhe and asking your peers “Kei te pēhea koe?” for a week. It’s about recognition of a language and a culture that has historically been marginalised and sidelined. Furthermore, it’s about interacting with te reo in whatever way that is relevant to you and creating space to express and celebrate Aotearoa’s indigenous culture. Karawhiua e te whanau!